HARMONIK WELCOMES TI PAPI PICTURES & REHEARSAL VIDEO + SCOOPS ON ZENGLEN. J PERRY. KALIKO ON FORT LAUDERDALE FEST RUMOR. DANO ON WHY HE REHEARSED WITH BELJAZ! HARMONIK WELCOMES TI PAPI PICTURES & REHEARSAL VIDEO + SCOOPS ON ZENGLEN. J PERRY. KALIKO ON FORT LAUDERDALE FEST RUMOR. DANO ON WHY HE REHEARSED WITH BELJAZ...after quitting the band! 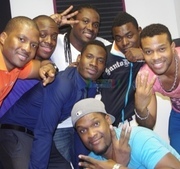 *HARMONIK 2.0 & TI PAPI: AFTER WORK...IT'S TIME TO STRIKE A POSE...SEE PICTURES! *HARMONIK WELCOMES TI PAPI PICTURES AT REHEARSAL! *KALIKO ON IF HE WILL BE WORKING WITH FORT LAUDERDALE FESTIVAL! *WHY DANO WENT TO REHEARSE WITH BELJAZ.....AFTER HE QUIT!